The next Interstellar. Brilliant . . . if you liked that movie. Unfortunately, I didn’t. You can see where I’m heading with this. A linguist (Amy Adams) is recruited by the military to assist in translating alien communications. The endless Twitter trends, the crazy hype train. I was actually excited to see what the man who brought us Prisoners could deliver. I’m not going to lie. By the time the credits rolled, I was left feeling a little disappointed. An emotionally charged opening sequence (that rivalled Up) plucked on the heartstrings as we followed Louise’s (Adams – Nocturnal Animals) relationship with her daughter over the blossoming years. Right up to her swift and tragic illness. Bleak, heartbreaking and we hadn’t even got to the aliens yet. The pace was left to simmer away and I was happy to allow the bubbling tension and theorising develop as Louise was recruited by Weber (Forest Whitaker – The Last King of Scotland) after 12 strange objects descended from the sky. Adams was superb and delivered a sterling turn. She really carried the film for me. I wish more was made out of the supporting cast. Whitaker disappeared into the background far too much and Michael Stuhlbarg (Boardwalk Empire) was completely wasted in his role as the shady Agent Halpern. Just another generic government agent. The only other actor to make a memorable impression was Jeremy Renner (The Hurt Locker). His quips and chemistry with Adams was a much needed presence as the pair worked together to assess whether our new visitors were friend or foe. 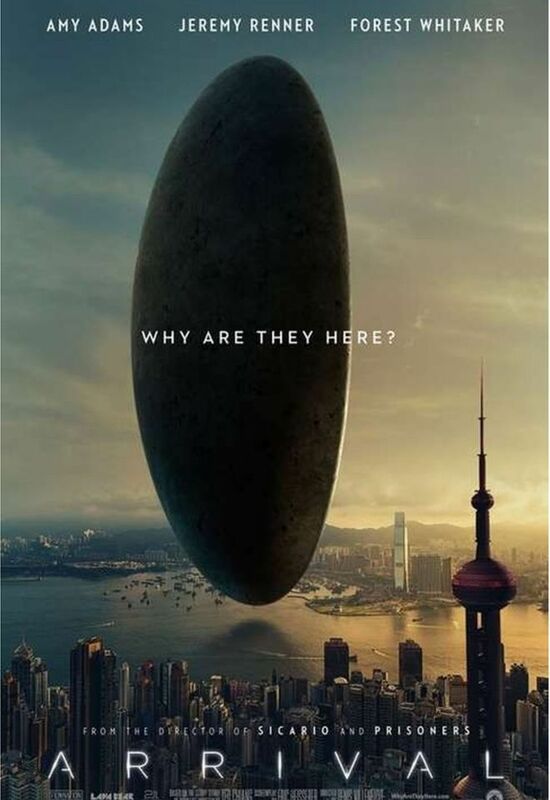 I was actually quite impressed by how writers Eric Heisserer and Ted Chiang thought up such a situation. It was almost believable in a way if a superior race were to suddenly appear and try to communicate in an indecipherable and unknown language. The special effects and CGI on the strange tentacly guests were fantastic. The motion capture methods to create their movements was impressive. They reminded me a little of the jellyfish things from Monsters. The cryptography and puzzle solving as Louise and co. tried to form a dialogue was intriguing enough BUT by the 60 minute marker, I could feel my patience wading. My interest lost. I didn’t even mind that we hadn’t received any answers or real questions to ask the sinister looking squid things. BUT the pace really did drag and it was like pulling teeth out to get anywhere. The constant flashbacks to Louise’s daughter and bizarre dream sequences (at first haunting and hypnotic) soon irritated and numbed me into a mini-coma. Thankfully as the growing tension and civil unrest across the world forced the UN to make a (predictable) decision, I was soon pulled back in. The paranoia and suspense finally going somewhere with the military desperate to scratch those itchy trigger fingers. The rising insurgence among the ranks. The hidden agendas from the international compatriots. The world in arrears. If anything, this was all too realistic with China and Russia refusing to share information and desperate to cut ties and eradicate this unknown presence. All spurned on from one word (Finally deciphered) as “WEAPON”. A reference? A threat? A simple misinterpretation from the linguistic team? The final 20 minutes was frantic, thrilling and . . . unexpected BUT rewarding? I won’t say too much about the ending. BUT I will admit that I’m NOT the biggest sci-fi fan. Blade Runner, Alien, Twelve Monkeys, Looper; sign me up. Anything else . . . meh. Once I heard the phrase, “non-linear time difference”, the wind had been knocked out of my sails. Like Interstellar, Arrival delivered a cleverly woven ending with time paradoxes and hidden meanings galore. I was afraid that I missed something. I checked the forums and discussed theories and realised I had it sussed the first time. BUT for all the hype and twists and turns, it just didn’t grab me. I wasn’t caught up in it as much as I hoped. It was good BUT . . . a defining science fiction film? 5/5? Film of the year? I don’t think I’ll remember this by next month. Maybe it was a case of hype hindering rather than helping. I felt the same for Sicario. Wondering if people had never seen a movie about the underbelly of the Mexican border before. If Adams wasn’t at the helm, I don’t think my interest would have been grabbed at all. I felt for her character, shared in her grief and frustration as the ever-impending deadline pressed on. I didn’t hate it. There were genuine moments of suspense and tension. I don’t know how Bradford Young’s grainy cinematography could make a scene look so bleak and beautiful at the same time. Johann Johannsson’s musical score was sublime. It was perfectly composed and really heightened the mood and emotion of the scenes. Especially in the closing moments. A clever, well acted, if muddled and drawn out affair for me. It certainly left for food for thought BUT one to remember?